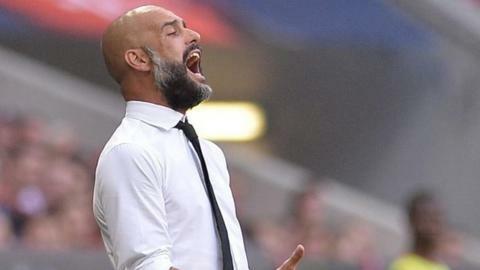 Bayern Munich coach Pep Guardiola walked out of a news conference on Friday after being asked about reports linking him with the England job. Guardiola is out of contract with the Bundesliga champions next June, but has refused to discuss his future publicly. Reports on Friday suggested the Football Association wants the former Barcelona boss to succeed Roy Hodgson. Pressed to comment, Guardiola said: "Oh come on, I'm coach of Bayern Munich. Many thanks and auf wiedersehen." He then left the briefing, organised to preview Bayern's trip to Mainz on Saturday. Hodgson's contract with England expires after Euro 2016, and his future will not be discussed until the tournament is over, FA chief executive Martin Glenn has indicated. Guardiola made clear at his news conference he did not want to discuss the issue, having earlier answered a more general question about his future plans with a polite "next question please". The 44-year-old has led Bayern to two Bundesliga titles in his two years at the club, yet he questioned at the start of this season whether he was the right man for the job. He said he would step down if he ever got the feeling somebody else would be a better choice for the club, leading to speculation that he will leave next summer. Bayern have said that negotiations over a new contract would be held as and when Guardiola is ready.